Desert Primrose 10.5" x 8"
I love these flowers, such a beautiful pink and a warm yellowish glow in the center, and then there's the lovely darker pink veins. . . in the spring, they look like a carpet of pink in the desert. 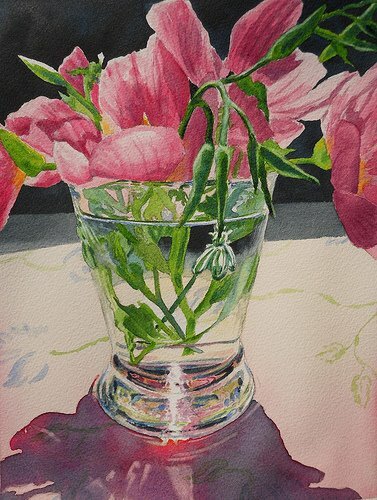 But really what got me to paint this watercolor was the bee on the glass. So cool. I love that bottom of the glass...makes me wonder how did you do it! Thank you Arti! I really enjoyed doing that sparkle! Gracias Ina! Tan bonitas tus esculturas de luz! y tambien los cuadros. Gracias por la visita. Amazing work ! Gorgeous composition and light/shadow. The flowers are beautiful but what you've got going on with the glass highlights, shadows and reflections are fabulous! Thanks Kathleen! I enjoyed getting that to sparkle so much I'm doing some more with that in mind. Just came across your blog, you do beautiful work! I love the light reflections through the glass,simply gorgeous!